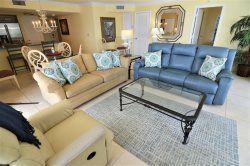 Amazing views fill the 5th floor of this condo rental near Sanibel Island. A screened-in, tiled balcony with ceiling fan/light is included with this condo rental. Sanibel Island and the barrier islands are just over the sparkling waters, and beautiful sunsets will be visible every night during your stay. This condo is very well-appointed and designed with an appealing Florida-style decor. Kitchen renovation completed in the summer of 2015 with high end stainless steel appliances, granite counters, cabinetry, and tile flooring. Equipped with new furniture, upgraded doors & crown molding throughout. A screen door accompanies the entry door which allow for more sunlight throughout the unit. There is a 65" HD TV in the living room, 50" Smart TV in the master bedroom and both are also equipped with a DVD player; the guest bedroom also features a TV. Enjoy a meal on your furnished balcony while watching for dolphins in the water below! King bed in the master and queen in the guest bedroom. Both Bathrooms renovated 2017 for a relaxing experience. Sleeper sofa in the living room. You may have found this rental on HomeAway 4363822, HA ID 4363822, VRBO 4363822ha, or Vacation Rentals 4363822. This was our second year in a row at Resort Harbour, and we're already planning our next stay. It never feels overcrowded even during peak season, and only 15 minutes from Fort Myers Beach. Our unit is i n great location. We had a great stay!